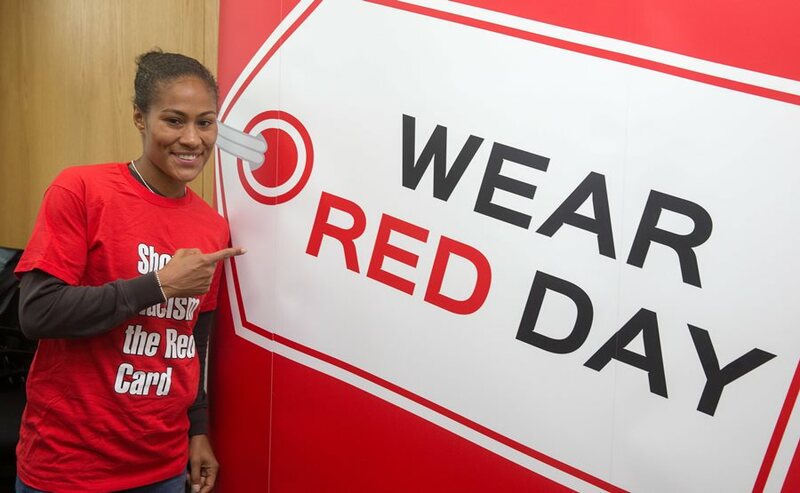 Show Racism the Red Card (SRtRC) officially launched Wear Red Day 2016 on Friday 9th September with help from a variety of famous faces from the worlds of sport & politics. Former professional footballer & TV personality Chris Kamara was joined by England & Arsenal legend Rachel Yankey OBE, former professional Paul Elliott, Unite the Union General Secretary Len McCluskey & Kate Osamor MP, all of whom gave their backing for the campaign. Rachel Yankey OBE also reminded her followers to save the date and get involved. SRtRC would like to thank all of those who have shown support for Wear Red Day and for the wider campaign. 2016 marks SRtRC’s 20th anniversary, and the charity could not have achieved all it has with out the support of patrons, trade unions, local authorities and members of the public. A gallery of images from the Show Racism the Red Card Wear Red Day 2016 launch event held and Unite the Union HQ can be viewed here. In order to continue the essential work of discussing racism in a safe & non-judmental environment and providing an opportunity to educate about the dangers of racism, initiatives like Wear Red Day have never been more important and SRtRC would encourage everyone to get involved in what ever way they are able. Alternatively, you can email info@theredcard.org to register for Wear Red Day 2016 and recieve your Fundraising Pack.